Good morning! Breakfast this morning was delicious, and is worthy enough to compete with the best. These Blueberry-Lemon Ricotta Pancakes are a good example of the boundless possibilities of pancakes. Serve them topped with your favorite syrup, additional fruit, or fresh whipped cream. These pancakes could even be offered for dessert – try them a la mode. Because they contain ricotta cheese, use a good-quality nonstick pan or well-seasoned griddle or skillet with even heat distribution, so the delicate batter doesn’t stick or burn. Spinach Lasagna is a healthy, super flavorful pasta dish that the whole family is sure to love. A few weeks before my son was born, I decided I wanted to stock the freezer with pre-made dinners that only had to be reheated in the oven or stove top. This would help us in the first weeks after bringing baby home, and ensure we were still eating well. Artichoke Lasagna Rolls are a perfect way to use up left over lasagna noodles. I always seem to have a few left in the box – not enough for a whole pan of lasagna. You may assemble the rolls ahead and refrigerate them until you’re ready to bake them. 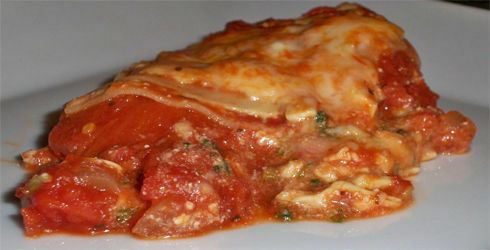 Any leftover Artichoke Lasagna Rolls reheat nicely – just microwave them for 1 to 2 minutes. When I made this recipe, I only had no-boil lasagna noodles in the pantry. So, instead of making rolls I simply made lasagna the classic way (by layering sauce, noodle, ricotta mixture, mozzarella ect. ), just on a smaller scale using the 8×8 dish. Sometimes you need scaled-down recipes. Maybe you live alone or with just one other person. Maybe the rest of the family is out doing something else, and you don’t really feel like preparing a lot of food. No matter why you’re on your own, this is a recipe to turn to. Artichoke lasagna rolls are also awesome if you are looking for low-fat recipes. Coming in with 545 calories, 12.7 grams of fat, 8.4 grams dietary fiber, 10 mg cholesterol, and 547 mg sodium per serving, Artichoke Lasagna Rolls and good for you too. You don’t have to be a non-meat-eater to appreciate the deliciousness of the low-fat recipe.